Everyday Happy Makes is a company that makes products better for the environment, all-natural. 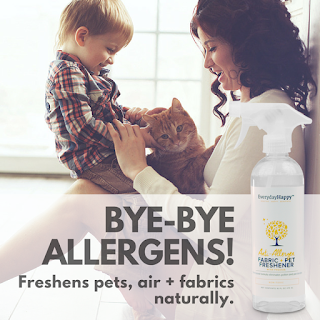 They just released Anti-Allergen Fabric + Pet Refresher that is gentle, non-toxic formula neutralizes allergens on contact and can be sprayed everywhere around the house; consider it your fast-track ticket to cleaner air. It’s even gentle enough to use on fabrics and, yes, pets. Enjoy a refreshing burst of freesia as you eliminate mold, mildew, pet dander, dust mites and pollen, ensuring you and your family can breathe easy. Soothing Lavender Bubble Bath is going to get your little one in Bedtime Mode ASAP. Bubble up and tucker out your tiny baby with some super fun bath time play and let the soothing lavender aromatherapy help calm them down for a trip to Dreamland. My Opinion: I like that the ingredients are not harmful to me or the environment the bubble bath smells amazing and I also enjoyed using it to take a luxurious bath in to relax and let all stress disappear that is currently in my life. The Fabric+ Pet Freshener I sprayed on my couch and I also have a dog so knowing she will not be harmed and it just made the living smell so much better. EverydayHappy is a proud supporting member of both the Organic Trade Association (OTA) and People for the Ethical Treatment of Animals (PETA). We're committed to choosing naturally-derived and sustainable ingredients, all free of animal testing or byproducts. We believe these choices are an integral part of making life happy, healthy and beautiful.